Perhaps it wasn’t the warmest or sunniest Memorial Day weekend, but the dogs at Orphans of the Storm® didn’t seem to mind much! Since it was a quiet day at the shelter, the pooches and I got to spend some quality time exploring and playing in the off-leash run. 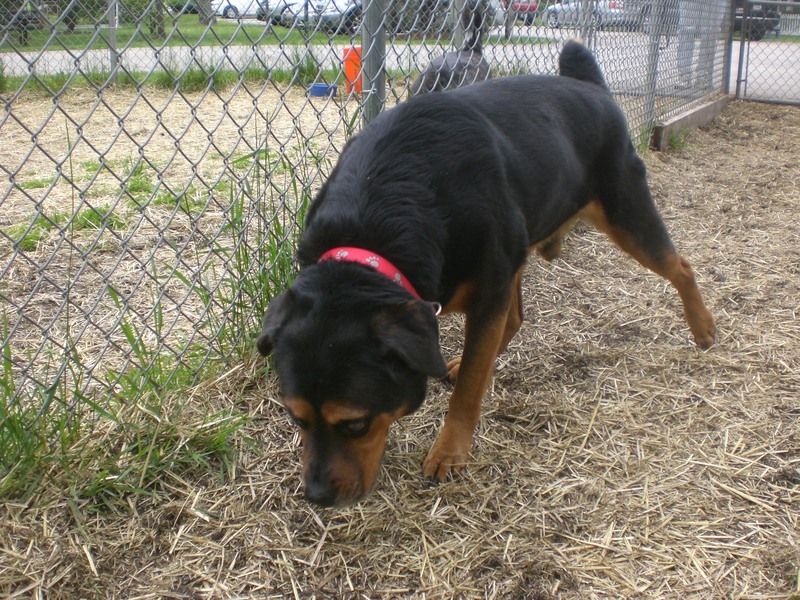 Giorgio the 10-year-old Rottweiler mix is a giant sweetheart. He may look a little big and intimidating, but don’t be fooled by looks alone! 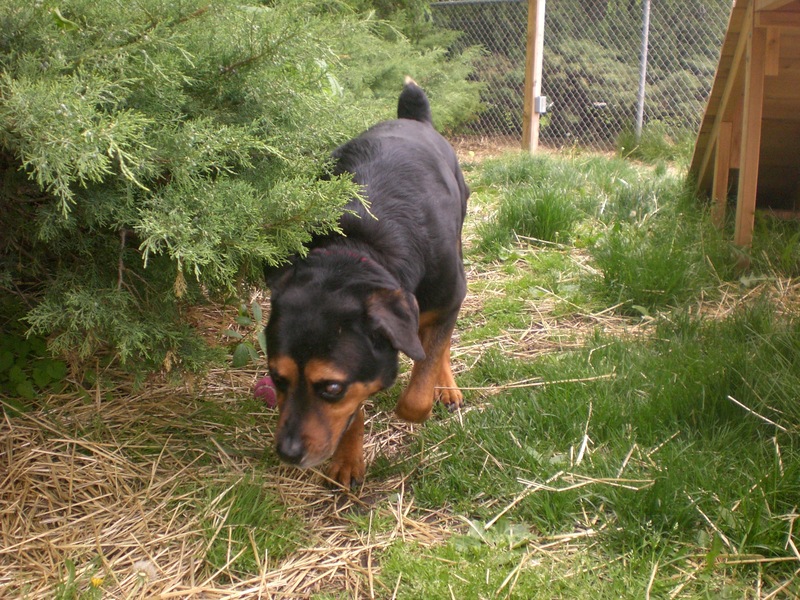 Behind that brawn is a lovable dog whose short, little Rottweiler tail wags constantly. You may think that a dog the size of Giorgio would be the one walking you, but that is not the case. Giorgio is an excellent walking buddy who didn’t pull on the leash at all while we were out. Since Giorgio is an older gentleman, he probably doesn’t require as much exercise and playtime as a younger Rottweiler would. A nice walk around the neighborhood would be much appreciated, and then Giorgio will be happy to snuggle with you. That big face of his is just impossible to resist. Giorgio also seems to get along with other dogs–Roxie was in the off-leash run next to ours and was barking right in his face, but Giorgio just kept sniffing the grass and wagging that tail! 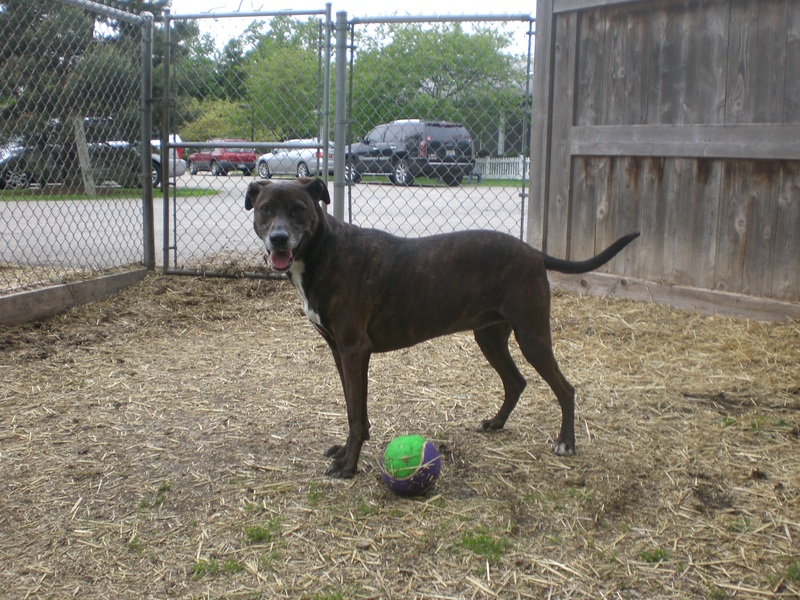 If you’re looking for a big, lovable, older dog, come in soon to meet Giorgio! Gizmo the two-year-old Pit Bull Terrier mix is another dog whose tail just can’t stop wagging. 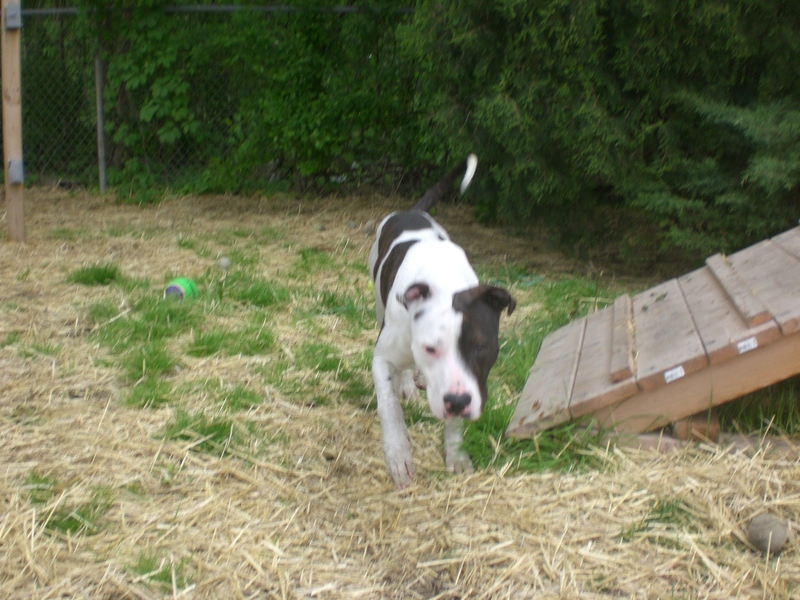 This guy is smaller than the average Pit mix and has the cutest brindle markings on his mostly-white fur. Gizmo is also a hero! He donated blood at an animal shelter and saved another dog’s life! How many dogs get to have that on their resume? Gizmo is absolutely a people-dog. All he wants is to be close to someone. 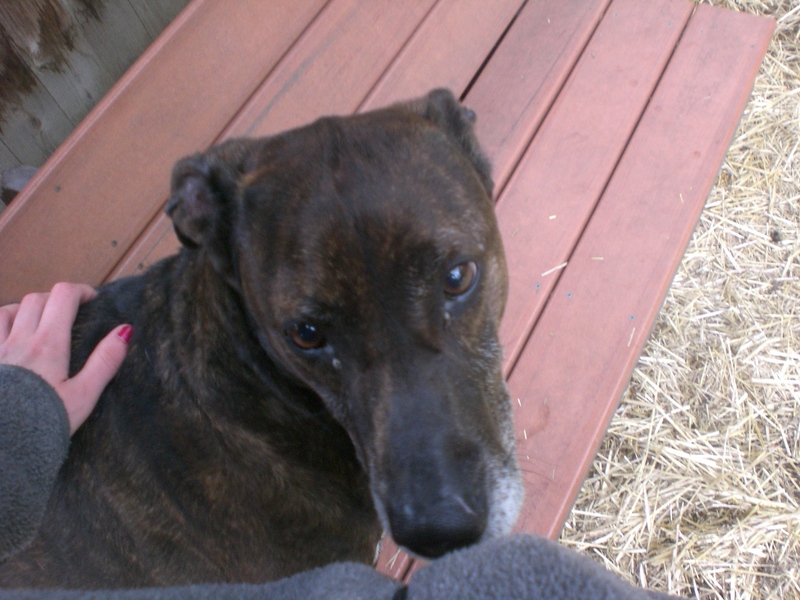 He sometimes jumps up to give a doggy hug, and also joined me on the bench when I took a seat. He even climbed up to the top of one of the picnic tables to get face-to-face and snuggle some more. What a little lovebug! Gizmo is ready to join a family who will love him just as much as he will love them. Jade the four-year-old Hound mix unfortunately doesn’t do such a great job of selling herself when she’s inside her kennel. But who can blame her? I’m sure I would be nervous if I were in her position. As soon as she was on a leash and out in the grass, though, she was a friendly girl who just wanted a chance to stretch her legs and play with someone. You can’t always judge a dog by how it acts inside its kennel–that’s not the environment it will be in when it joins your family! Jade, being a Hound mix, loved being outside. She was even pretty good at playing fetch! (She and Eever are, I think, the only Hounds I have ever met who play fetch.) Jade is one of those talented dogs who can play fetch with herself by throwing the ball into the air with her mouth. She prefers to play with a human companion, though, since a person can throw the ball farther than she can. 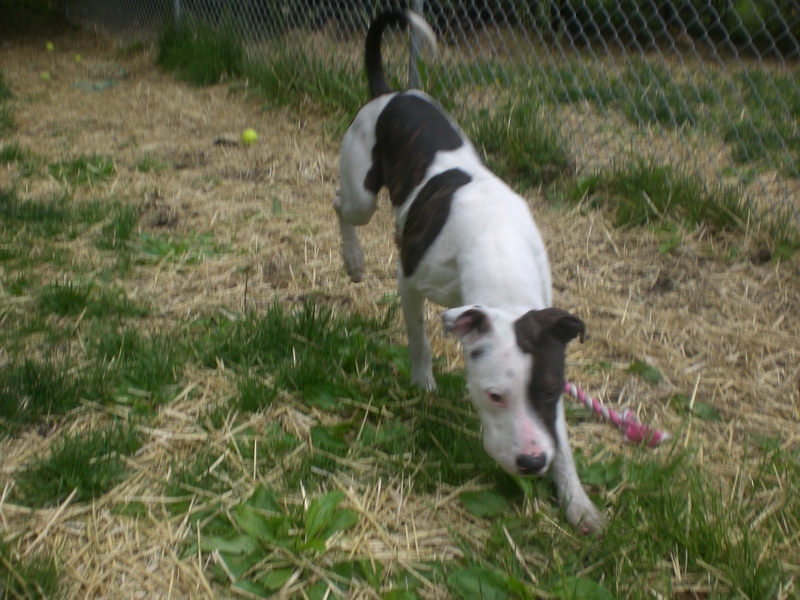 If you give Jade a chance, she will show you what a wonderful companion she can be! There was also a barbecue happening for Memorial Day while I was at the shelter, and Freckles and Buckeye were the hosts. I love, love, love, love, LOVE these two. I can’t say enough good things about them. They get to go to almost all of the off-site events because they are so well-behaved and friendly with everyone. If you have space in your heart and your home, adopt this pair! Posted by Meet the Pooches on May 30, 2013 in Dog Profiles and tagged adoption, animal shelter, animals, Chicago, dogs, Hound, Orphans of the Storm, pets, Pit Bull Terrier, Rottweiler. You guys are doing amazing work – I will continue to share your blog in hopes we can find these pups the homes they deserve! Thank you so much! We really appreciate you spreading the word!